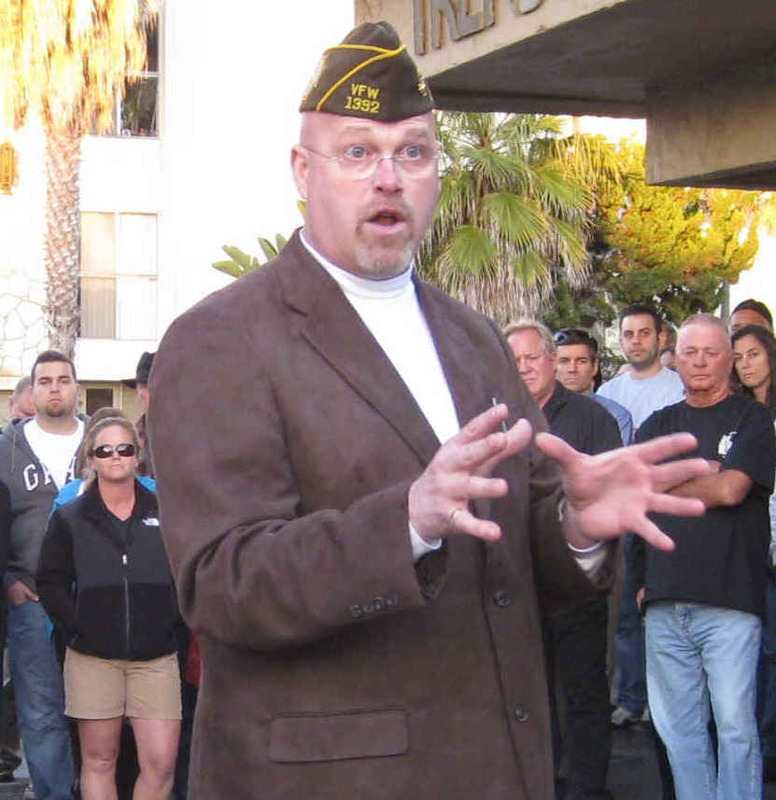 VFW Post Commander Bill Harvilla during sidewalk meeting held Jan. 28, 2011. Last Friday, Feb. 4th, a meeting was held in Councilmember Kevin Faulconer’s office to deal with the controversy of the VFW Post opening on Point Loma Avenue, and the initial report of that meeting sounds like community members are now trying to help the Ocean Beach VFW members find a new location for their Post. Apparently in the meeting attended by representatives of the OB VFW, of the OB Planning Board, the Mainstreet Association, and “community members” Nancy Vaughn and Michael Zucchet, the vets agreed to put “on hold” the opening of their place in southern OB, and that the community has agreed to find them another suitable location. The vets have a couple of requirements: any new site has to be in the 92107 zip area and must include between 2000 and 4000 square feet. So in summary, it seems clear that if they can find another viable location that fits their needs, they will take it. In the meantime, they are “on hold” at the 4705 Pt. Loma Ave. location and are spending their time looking for alternatives. I am NOT saying that they have made a final decision to not pursue that location…but as I said, I believe if they can find a viable alternative and can extricate themselves from the lease they signed, they will likely take that path. …. 1) It has to be in 92107…moving zip codes changes the process for transferring their liquor license to a much longer, prohibitively more expensive process. There may also be issues with their VFW charter if they move from the 92107 zip code, so moving to 92106 or 92110 or any other zip code seems to be a non-starter. 2) Their ideal square footage would be about 3500 sq. ft., but I think they will seriously consider anything from 2000 to 4000 sq. ft.
We need to use our collective knowledge, contacts, and creatively to help them find an alternative suitable location. This is the single most important thing we can do to help resolve the situation. If anybody has any ideas or leads, especially any “off market” opportunities, please contact me or others associated with this effort (including Bill and the VFW directly) with the information. Tentatively, Kevin Faulconer wanted to re-convene the group and check progress in another week to ten days. The only “bad news” is that there are currently no obvious alternative VFW locations. The VFW has been looking–hard–and they seemed very versed in every possible location that was thrown at them. They clearly have done their due diligence looking for a new location. Every idea that folks at the meeting had about a new location had already been researched by the vets, to no avail, Zucchet reported. We have been asked to spread the word about this. Anyone with ideas should contact Faulconer’s office at 619-236-6622. Good for Mike Zucchet !!!!! Zucchet….Point Loma’s poster child for upstanding citizen….NOT! similar thing happened here in North Park a month or two ago… bar on 30th wanted to upgrade license to go til 2am on weeknights… neighbors rose up against… cops/ABC/whoever said “thanks for the input” and let the bar do what it wanted. You must be talking about The Bluefoot. Tho quite honestly I like that place. Wouldn’t it be ironic if the VFW gave up on Pt Loma Ave, and then a real bar decided to move in to that space? It would be and rather funny if that does happen. Shane, I’ve always maintained that if Thee Bungalow had moved in to that same spot, local residents would have been delirious in excitement. Imagine if a straight-up dive bar moved in… the neighborhood temperance movement would really kick into high gear. But unlike the VFW, which has offered to compromise and even look for another place, the dive bar would be much less likely than the VFW to give a damn what any neighbors think. Right on Shane. All the employees and businesses at the San Diego International Airport agree with you. Damn the neighborhoods and who cares what the community thinks. Hopefully they find a space soon, I think it’s pretty disgraceful that they are having such a hard time. And with so many empty storefronts around town you’d think this wouldn’t be so hard. I hear Jim Bell has some space to rent? what about the Dream Street location? i don’t know the specifics, but they closed their doors a few weeks ago. Being a neighbor close by since 1967, I think the VFW should stick to its guns and not relocate! This controversy really is about “seedy” old vets being totally looked down on by a self-described “polite” society who have far less right to this commercial location than these poor shot-up guys from the Vietnam era. It’s funny too that the ” anti” group is represented by Zucchet (which rhymes with “bucket” according to the testimony of one of his former Vegas backers during the Strippergate affair) — who should probably recuse himself in matters of what is proper propriety and how it is conducted.